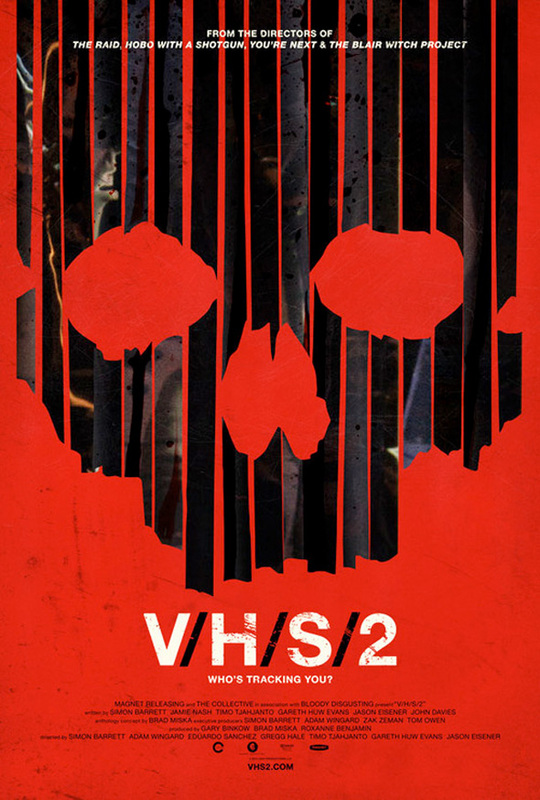 Who's Tracking You on the First Poster for Horror Sequel 'V/H/S/2'? Though it premiered under the title S-VHS at the 2013 Sundance Film Festival earlier this year, when the horror anthology sequel hit SXSW, it went with the less confusing, but less clever, title V/H/S/2. But still, fans should be excited to see the sequel which we called crazier, gorier, scarier, wilder and even funnier that the first film. Now the first poster for the sequel is here with the clever tagline "Who's tracking you?" and touting the credits of the directors of The Raid: Redemption, Hobo with a Shotgun, The Blair Witch Project and You're Next. This one will be a real treat for horror fans, and we're excited to see it again. Poster below! V/H/S/2 is the sequel to the 2012 Sundance Film Festival selected found footage horror anthology V/H/S and this time directors Gareth Evans (The Raid), Timo Tjahjanto (Macabre) Eduardo Sanchez (The Blair Witch Project) and his long time producer Greg Hale, Jason Eisener (Hobo with a Shotgun) and Adam Wingard (You're Next) are all at the helm of segments, in addition to V/H/S segment writer Simon Barrett making his directorial debut. V/H/S/2 premiered at the 2013 Sundance Film Festival (our video review) and played SXSW 2013, but Magnolia Pictures releases it on VOD June 6th and in limited theaters July 12th. That original title was much more clever. How lazy. I blame the distributor. Honestly, though it's a less clever title, there are plenty of dumb people who probably wouldn't have realized it was a sequel to V/H/S under the original title. Yeah, gotta think of the audience. It is a horror movie after all. You're right, sorry for all the snark. I really liked the way they were naming these. It was real cool that they were giving them iconic names. Yes, the nerve of investors wanting to maximize their earning potential. Gadzooks!! All they had to do was keep the S/V/H/S treatment, and slap some "The sequel to V/H/S" on the posters and ads. In the same way package designers always remind you it is "the same great product" when they update the package design. Absolutely cannot wait for this sequel, me and my friends loved the first one. If the kids don't know what S-VHS is, how the hell would they know what 'tracking' is?